The holidays have arrived! 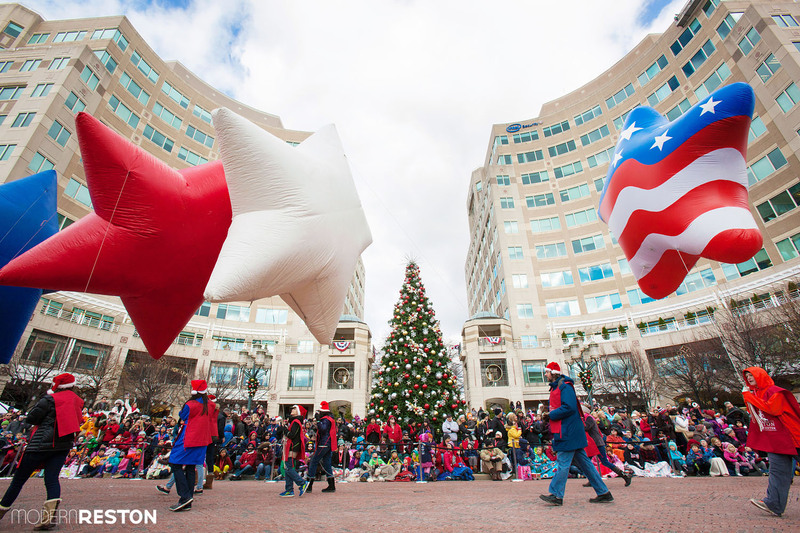 Here are some of the greatest celebrations of Thanksgiving, Christmas, and Hanukkah in Reston and the surrounding areas of Northern Virginia and Washington, D.C.
One of the area’s most fun traditions is the Reston Holiday Parade, which takes place each year on the day after Thanksgiving. 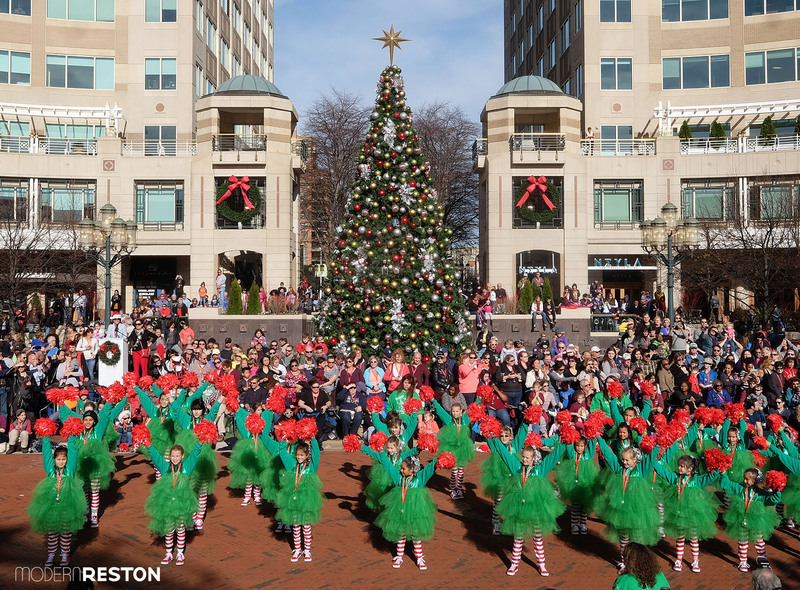 On the day after Thanksgiving each year, Reston Town Center offers a full day of holiday fun, including a parade, visits with Santa, and the Christmas tree lighting sing-along. Take the little ones to meet with Santa and then enjoy a trail ride through Reston Town Center. Pick up is in front of Talbots on Market Street. Requested donation benefits Cornerstones charities. 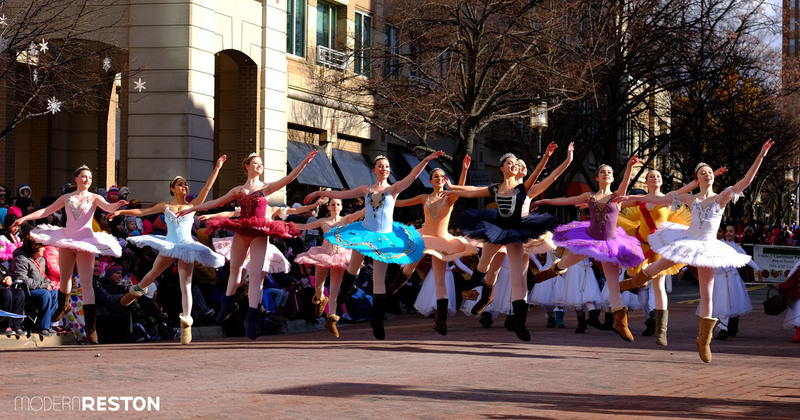 This Reston ballet company will perform a holiday dance on Market Street in front of the large Christmas tree. Watch the holiday tree lighting, visit with Santa, sip hot cocoa, and enjoy live entertainment, and then watch a screening of How the Grinch Stole Christmas. 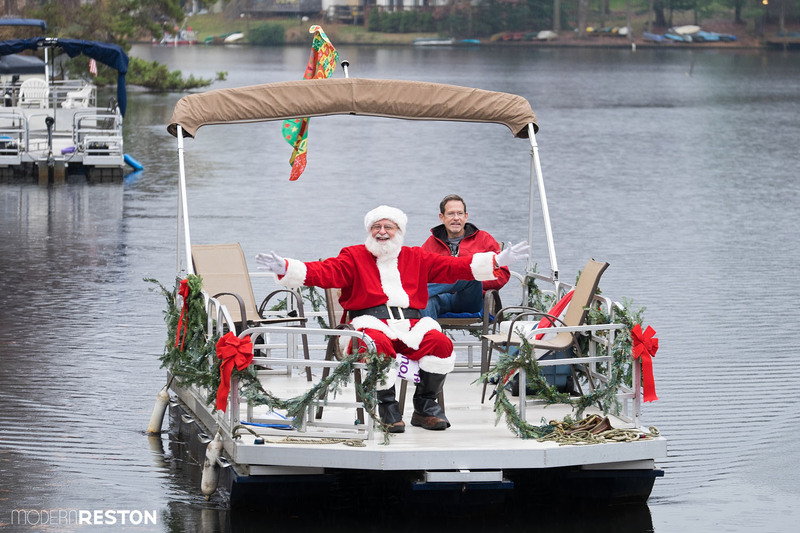 Bring the kids to Lake Anne on December 3rd to see the thrilling arrival of Santa by boat. Kids age 3-14 can take a special canoe ride with Santa, and then enjoy a swim with their families. Restoration Church will lead Lake Anne’s tree lighting and a Christmas sing-along and provide homemade cookies for all the singers. FREE. Alexandria’s harbor lights up as dozens of illuminated boats cruise the Potomac River at the historic waterfront. Wear your most festive holiday costume as you run, and bring your kids for the free kids fun run. More than 80 vendors will offer unique gifts, holiday decorations, and handmade items. Enjoy a special holiday visit and take a wagon ride with Santa through the woods and fields. Activities include a holiday craft, cookie decorating and puppet show. Register in advance. Tour Reston’s nature center while enjoying holiday refreshments, crafts, live music, and a family sing-along. FREE. Bring the little ones for a personal visit with Santa and take home a photo. Warm up with hot chocolate and cookies, and kick off the holiday season with festive crafts, activities and a take home treat. Reston’s Conservatory Ballet makes holiday magic come to life with its 44th annual production of The Nutcracker. Young dancers from the Reston area will perform this Christmas classic. The best part of Reston’s charming and popular German Christmas Market is that all the proceeds are donated to Cornerstones’ local charities. Listen to sounds of the season during a bike ride along the W&OD to the Reston Town Center Christmas tree. Hot chocolate and treats to follow the ride. Children need to bring their own bikes but Bikeshare bikes will be available for adults on a first come, first served basis. Free 24-hour Bikeshare memberships will be provided. Train rides, crafts, campfires, and holiday decorations add to the fun when kids meet and greet Santa at Lake Fairfax Park. Register online. This musical celebration includes performances by the Georgetown Visitation Preparatory School Choir and the American Youth Philharmonic Brass Ensemble, as well as a kids-only singalong. Visit Santa in the mill and see the Christmas tree trimmed with Victorian decorations. Join the costumed 49th Virginia Volunteer Infantry caroling around a bonfire while roasting marshmallows. The church and special guests will celebrate the music of Christmas and the spirit of peace. NextStop will present a one-night-only staged reading presentation of “Coney Island Christmas” by Donald Margulies, based on the story “The Loudest Voice” by Grace Paley. Tickets are $15. Reston’s Conservatory Ballet will present the Nutcracker during the week of December 7-11. This festival includes live music, holiday eats and drinks, kids’ crafts, face painting and more. Children aged 3-5 are invited to enjoy winter crafts, activities and a snack. Registration is required. This event for children includes craft projects, a visit with Santa and a reading of a holiday story by a special guest. 11am: RFK Stadium, Washington D.C.
Rummage up the Ugliest Sweater you can find and celebrate the Holidays by participating in the Merriest 5K of the year. An evening bike ride to view some of Reston’s best holiday lights, approximately 10 miles. FREE, but reserve in advance. Showgirls perform a holiday special with with unbridled enthusiasm, a slight lack of self-awareness, and copious amounts of holiday beverages. Recommended for ages 18+. Tickets are $25. Bring your holiday guests and join master puppeteer Bob Brown in a holiday production of the Nutcracker. Join the lively marionettes as they frolic in a magical winter wonderland of snow. After the show, stroll the Park and visit our animals or shop at the Country Store. Register in advance. 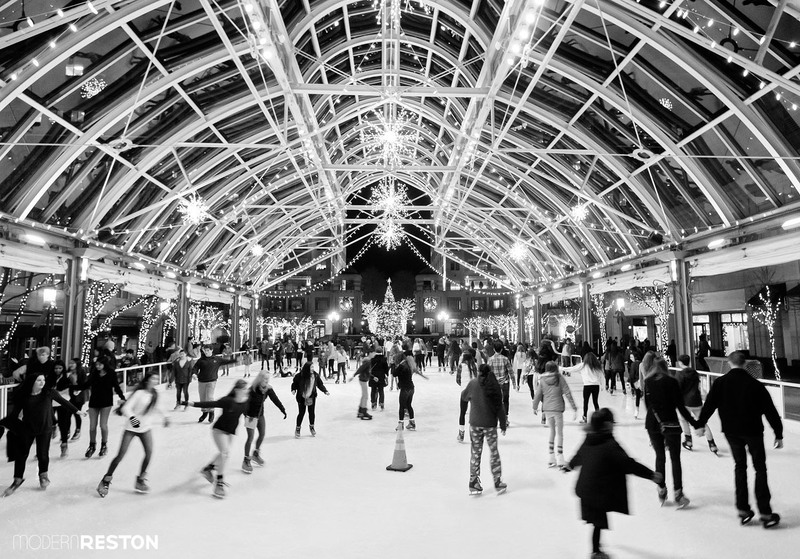 Reston Town Center’s ice rink will host a Chanukkah celebration on December 25th. Join the Jewish Community Center of Northern Virginia for songs and stories celebrating the miracle of Hanukkah. Complimentary Kosher donuts and chocolates provided. 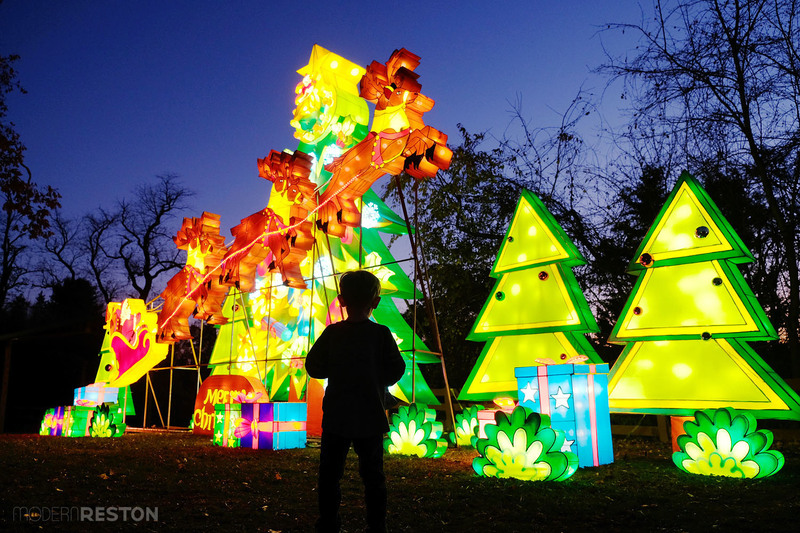 The new Chinese Lantern Festival is a gorgeous holiday lights show hosted by Roer’s Zoofari. 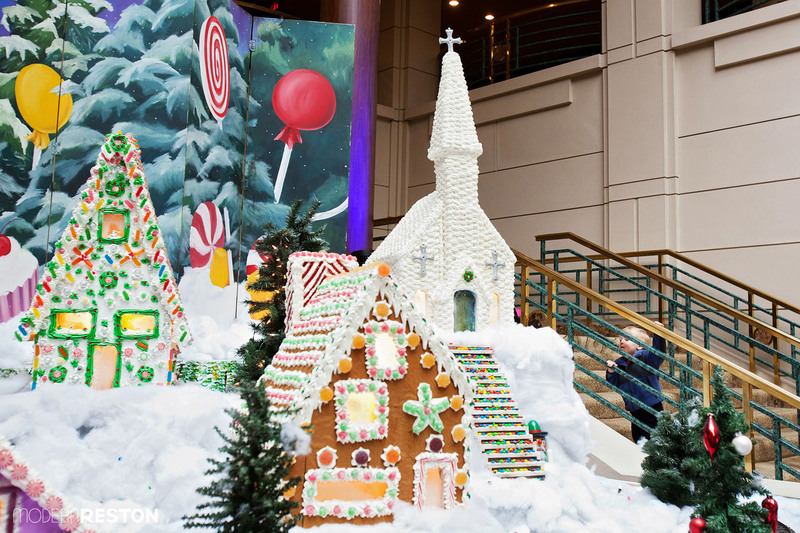 The Hyatt at Reston Town Center presents an intricate gingerbread village in its lobby every December. The Winter Walk of Lights transforms the botanical gardens of Meadowlark into a sparkling wonderland. 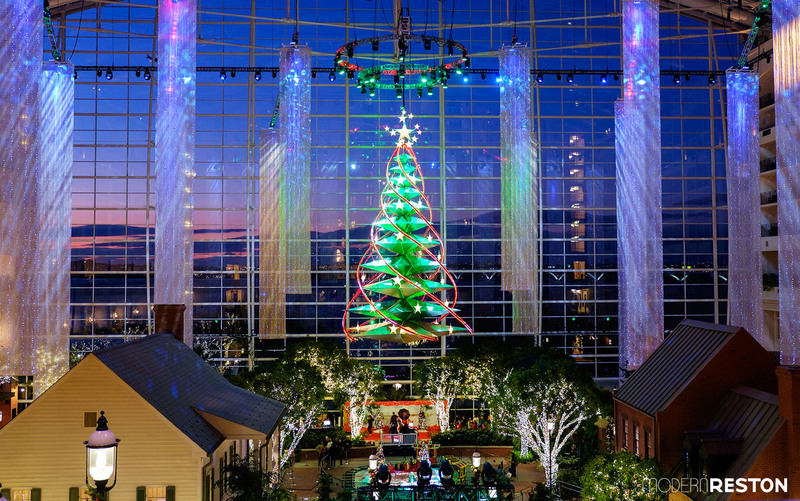 The Gaylord Resort at National Harbor offers an indoor Christmas village with beautiful decorations and fun children’s activities. If you’re looking for climate-controlled holiday fun, explore this indoor Christmas village that offers beautiful decorations, a mini train, indoor snowfall, visits with Santa, gingerbread decorating, an Elf on the Shelf scavenger hunt, and fun with costumed characters. Over 650,000 lights decorate the Temple grounds, and a different performing artist or group is showcased each night, including bell ensembles, choirs, and orchestras. FREE. Which holiday events are your favorites? Let us know in the comments!